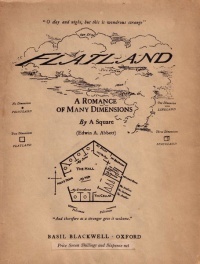 Edwin Abbott Abbott (December 20, 1838 – October 12, 1926), English schoolmaster and theologian, is best known as the author of the mathematical satire and religious allegory Flatland (1884). Abbott was the eldest son of Edwin Abbott (1808–1882), headmaster of the Philological School, Marylebone, and his wife, Jane Abbott (1806–1882). His parents were first cousins. Unless indicated otherwise, the text in this article is either based on Wikipedia article "Edwin Abbott Abbott" or another language Wikipedia page thereof used under the terms of the GNU Free Documentation License; or on original research by Jahsonic and friends. See Art and Popular Culture's copyright notice. This page was last modified 21:45, 20 February 2008.